Every day thousands of players flock to Zynga's Café World, clicking on food and serving it to the virtual masses for experience points and in-game coinage. That's some sweet action right there, and Cooking Mama wants a piece of it. 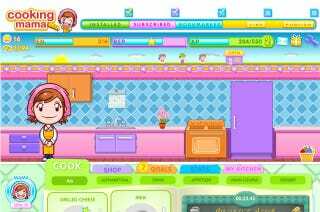 Majesco makes its Facebook debut today with Cooking Mama Friends' Cafe, weighing Mama's charm against already established games like Zynga's click-to-cook sensation. What does Mama bring to the table to help her stand apart from the competition? For one thing the new game is a bit more complicated than your average casual café simulation. You've actually got to buy ingredients to cook in this one, something you never have to worry about in Café World. Customers display preferences for food as well, granting the player bonuses if they work up a menu that pleases everyone. And what would a Cooking Mama game be without minigames? They're a pale shadow of the games in Mama's DS and Wii titles, but pouring juice, spreading butter, and chopping cheese is far more interactive than Café World's clicking. Can you click even better than Mama? Check out the game on Facebook to find out.